Ann Turner : Founder and coordinator of the Ground-Hornbill Research and Conservation Project. Shaun Wilkinson CEO Umgeni River Bird Park . Threatened with extinction ” The Ground-Hornbill’s critical walk to freedom ” is a truly inspiring conservation story. Produced by Birds of a Feather and sponsored by W W F THE GREEN TRUST and Sasol this documentary tells the remarkable and poignant story of how Ann Turner founded the Ground-Hornbill Research and Conservation project at Mabula Game Reserve 12 years ago. With less than 1500 birds left in the South African wild something urgently needed to be done to try and save the species from possible extinction and to ensure that its eventual walk to freedom has every chance of success. 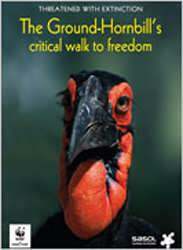 Be the first to review “The Ground-Hornbill’s critical walk to freedom” Click here to cancel reply.